Ultracoolers were designed for cooling of grape must, juices, wine and cognac before freezing. All offered models are designed and manufactured according to the most modern criteria to function properly with the minimum energy consumption in the production process. . 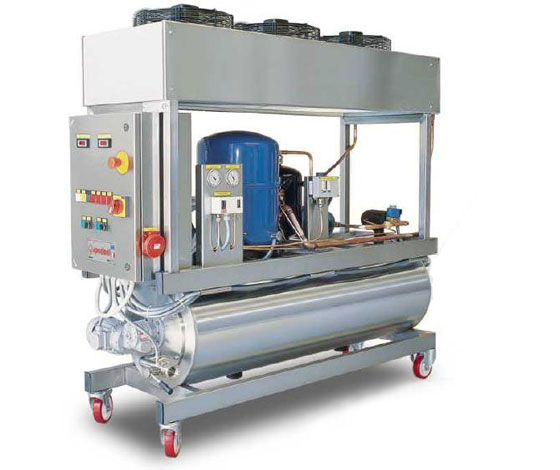 Most of the coolers produced by MECCANICA SPADONI made in monoblock version on a strong frame with wheels, taking into account the dimensions and weight of machines. 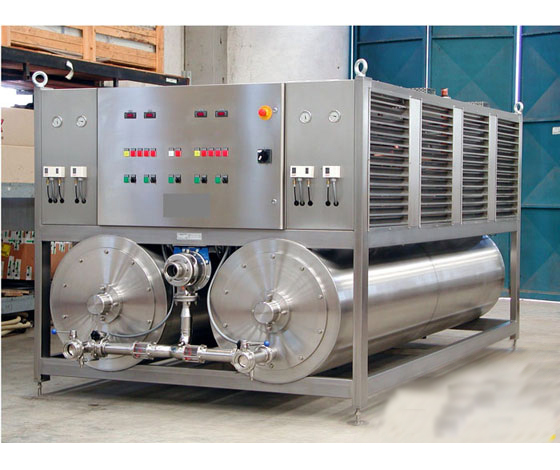 These machines with a capacity from 500 l/h to 13,000 l/h at a cooling temperature to minus 18 degrees. 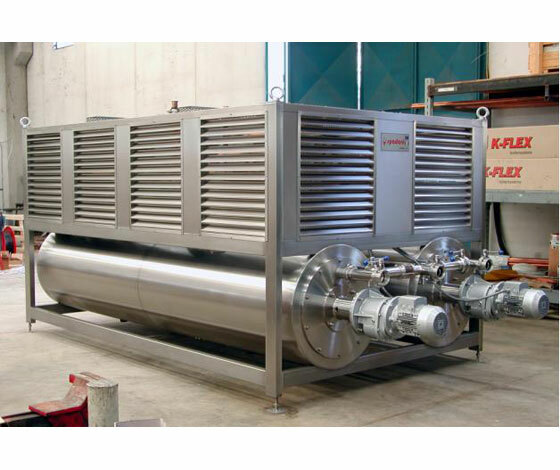 Suitable for the stabilization of wine and cognac, followed by feeding to the tank and endurance at the required temperature. 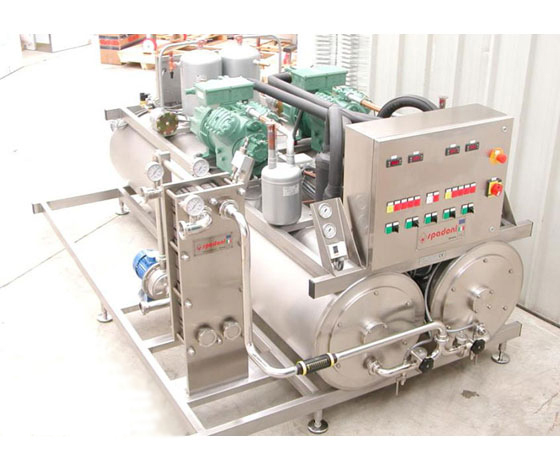 Only one pass ultracooler can reduce temperature product to -18 C.
Also, these machines can be used on the circulation of wine or cognac through the tank. When the temperature in the tank will rise above the setpoint, the ultracooler will automatically turn on. The method of shock freezing of wine and cognac, has a well effect on wine quality, and accelerates the process of tartar settling. At shock freezing we have oversaturated solution of salts of wine acid which in this phase begin to form crystals, and to accelerate the falling of wine stone (tartar). the advanced components installed on machines and process control. in the heat exchanger there is a coolant (R404A or usual R22) that expands and cools liquid (wine, juice, a must, etc.) which we intend to process. 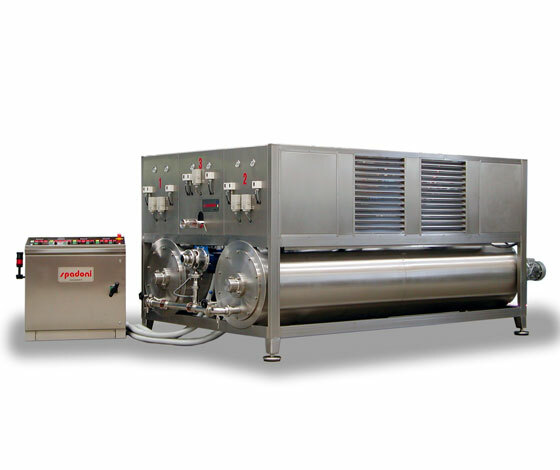 the evaporator is completely made of AISI 304 stainless steel, outside insulated by a covering of polyurethane. 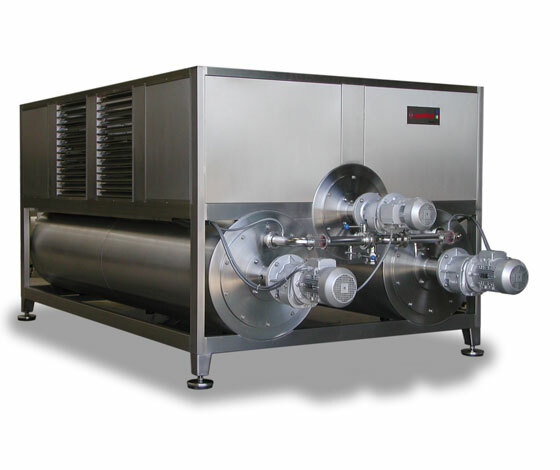 the surface of the heat exchanger from the formed crystals, ice and solid particles in general, making this type of machine, especially suitable for cooling liquids (such as wine), containing high percentage of solid particles. The scrapers are made of stainless steel AISI 304 and the drive from the motor reducer. The air condenser (consists of copper tubes with aluminum fins) allows to take away the heat, that were received during the liquid cooling. The condensers can be installed directly on the refrigeration unit that is more compact. If the air condenser in its dimensions is very large, it can be installed separately from the main module and supplied with system of remote control.